This week, Dr. Shivan Amin of DeKalb Medical will join The Weekly Check-Up to discuss the ear, nose, and throat conditions and current treatment options. Dr. Shivan Amin is a board-certified otolaryngologist, a head and neck surgeon, specializing in facial plastic and reconstructive surgery. Dr. Amin received his medical degree from the Medical College of Georgia. He then completed his General Surgery internship at the University of California San Francisco and residency at the Kaiser Permanente Otolaryngology – Head and Neck Surgery program in the San Francisco Bay area. Dr. Amin traveled to his home state of Georgia and Atlanta to complete a fellowship in Facial Plastic and Reconstructive Surgery with Emory University and Dr. William Silver, one of the founders of facial plastic surgery. An American Academy Facial Plastic Surgery fellowship position is awarded to only 40 candidates from the U.S. and Canada. Dr. Amin has received numerous honors and awards including induction into the Alpha Omega Alpha Medical Honor Society, given to the top 5% of medical school graduates. 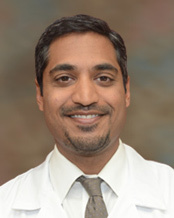 While at the Medical College of Georgia, Dr. Amin was elected president of the local chapter of the American Medical Association. In addition to practicing medicine, Dr. Amin takes pride is staying up to date with cutting edge research. His extensive research has awarded him authorship on a large number of publications and several book chapters. His interest in basic science research led to a WHO patent of a VEGF inhibitor drug for use in diabetic retinopathy and cancer treatment. To view Dr. Amin’s list of publications and presentations in its entirety, please click here. Dr. Amin recently joined Atlanta ENT Specialists, which is part of the DeKalb Medical Physicians Group, an affiliate of DeKalb Medical. He is proficient in all aspects of Otolaryngology, and subspecializes in face and neck plastic and reconstructive surgery procedures including rhinoplasty, facelift, facial reanimation, skin cancer treatment with defect reconstruction, and complex head and neck trauma. He has a strong interest in thyroid and parathyroid surgery, and has trained with some of the top endocrine surgeons in the country. In addition, he has extensive experience in the medical and surgical treatment of sinus disease, and has worked with Peter Catalano, one of the pioneers of Balloon Sinuplasty™, and has authored a publication on this technique. Although he calls Atlanta home, Dr. Amin enjoys traveling to other countries to provide healthcare in underserved regions. He has participated in medical trips to the Philippines, American Samoa, Western Samoa, Guatemala and New Zealand. When he is not practicing medicine, Dr. Amin can be found snowboarding, playing tennis or basketball, or cooking with his wife.